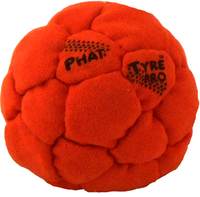 This footbag is built for stalls to the specifications of professional players. 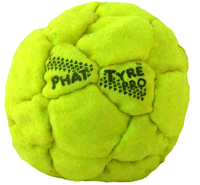 Featuring a very soft yet durable cover material and filled with a combination of steel pellets and ground up recycled rubber, no footbag will stall better than the PT Pro footbag. That's because of the heavy steel pellet filler. 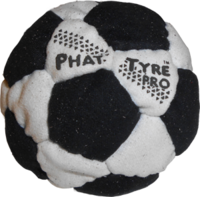 Adding 6 grams of ground up recycled rubber to the 74 grams or steel pellets ensures the footbag always impacts the foot with the with a cushion of softness. Featuring our original Flying Clipper 32 panel design, this beauty weighs in at a whopping 80 grams. 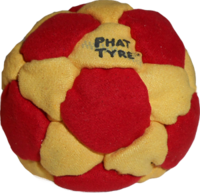 When we say "Phat" we mean "PHAT!" 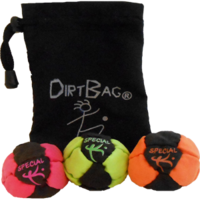 *Note: electric yellow is UV active and will glow under black light. 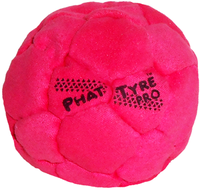 The PHAT TYRE PRO kicks like a springy rubber ball, but also stalls like nothing else out there. 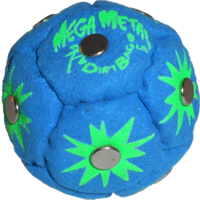 The weight and size is great because it's forgiving, giving me my highest consecutive kick count and also perfect to use in groups. I got the fluorescent/orange combo and love the way it looks, the tire marks are a nice touch. Props to Flying Clipper for continuing to innovate and come up with this winning fill. 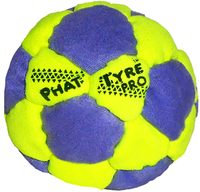 This is my favorite footbag of all time. 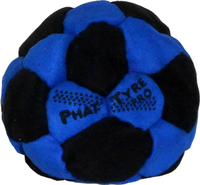 This footbag is fantastic. 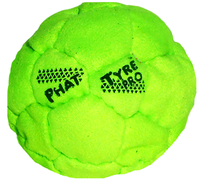 Its got a pretty decent weight, definitely a heftier one than the classic DirtBag or typical sand footbag. 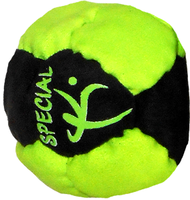 The rubber pellets inside cushion the metal bb's and also provide a good bit of spring, bounce or pop off of the user's knee or shoe. Great for groups. I'm super happy with this one and it's my go-to for the time being. 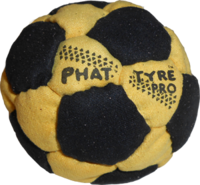 The Phat Tyre Pro is the easiest footbag I've ever owned. Just bought 3 for my friends (I'm generous that way : ). Of all the footbags I own, this is the one I like for myself.